Confession: I’m the parent of a picky eater. I’ve been fortunate that our two older children have been pretty laid back about school lunch. One of them always eats a lunch from home due to food allergies. He has been fine eating either a PBJ or ham sandwich, combined with a fruit and veggie, every school day for five years. Bless him. His younger brother likes to mix it up with a couple of hot lunches from the cafeteria each week, which makes my life even easier. Their five-year-old sister, however, has a short list of acceptable foods that is constantly changing. Sandwiches are considered poison. Even a food she likes (toast with jam), when put into a lunchbox-friendly sandwich form (slice of bread with jam) becomes poison. Scrambled egg: Yes, please. Hard-boiled egg: Why are you trying to poison me? She used to ask for a cheese quesadilla a couple of times per week. Now tortillas are inedible. Cream cheese in all delivery forms induces vomiting. While she’s not allergic to any food, nuts and nut butters are non-starters. She would eat melted cheddar on corn chips all day long, but offer her a cheese stick from the fridge and it’s a hard pass. The wrong temperature or texture of favorite foods are potential deal breakers. I could continue, but you get the idea. The foods she’ll consistently eat for me include almost any fresh fruit, a short list of fresh veggies, yogurt, and some hot meals usually reserved for dinner. As she just started full-day Kindergarten, I spent a good portion of this summer freaking out about what to feed her at school. While searching for filling, high-protein additions to her fruit/veggie/yogurt combo, I ultimately resorted to the Facebook brain trust for answers. I was completely blown away with the volume of fantastic ideas provided by friends and family. A few of them have already helped me out tremendously, and I plan to try more in the future. Besides the great suggestions, I think the most encouraging part was realizing how many other parents are in my same frustrating predicament. 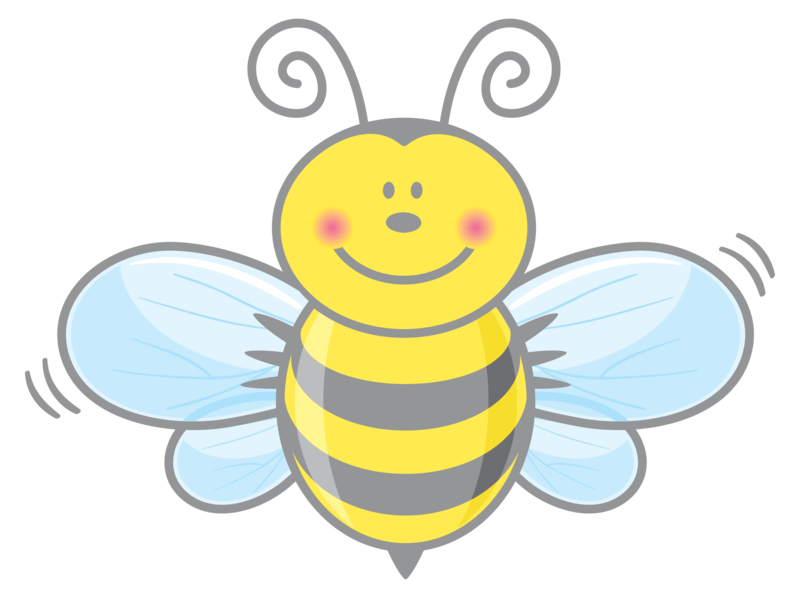 One preschool mom suggested I share the ideas in a blog post, so here it is, Donna! The following lists don’t even cover every suggestion I received. In the land of picky eaters, the bento box appears to be king. I have been carefully avoiding the bento box trend for years because I thought it was a little too precious. If I have to look to Pinterest to pack a lunch, that’s a bit much. The magazine-ready cut-out shapes just don’t fit into my crazy morning routine. And yet… here we are. 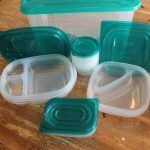 While I haven’t yet invested in a fancy (expensive) bento box, I did buy a set of bento-style reusable containers to fit into my daughter’s lunchbox. This whole collection was about $10, and I found it in the Fry’s seasonal back-to-school aisle. I’m embarrassed to admit that the idea of using a thermos for something other than a hot beverage never occurred to me. 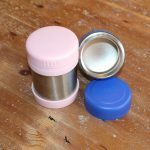 A little late to the party, I recently purchased a Thermos brand “Funtainer,” which is a 10-ounce insulated container designed to hold food. It will keep hot food warm for 5 hours, and cold food chilled for 7 hours. I’m pretty sure the thermos is going to be my go-to solution for at least two meals per week this school year. Where have you been hiding, thermos moms? 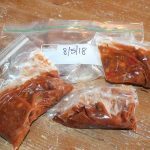 * Homemade chili: I made a large batch for Sunday dinner, and froze leftovers into single-serving pouches for lunches. I might make a batch of cornbread muffins and freeze those as well. 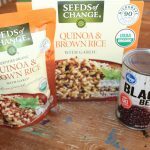 * Rice: Seeds of Change brand of quinoa and brown rice is one of my daughter’s favorites, and is ready after 90 seconds in the microwave. One bag of rice makes about four child-sized portions, which contain about 3 grams of protein each. Mix in some black beans for extra protein. I like the muffin idea because they are conveniently portion-sized, and easy to store in the freezer. Depending on the recipe, you can just let them thaw in a lunchbox, or heat in microwave and place in a thermos to keep warm. 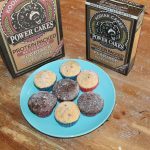 * Kodiak Cakes high-protein waffle mix has a muffin recipe on each box. We’ve tried the buttermilk mix and the dark chocolate mix. My daughter prefers the buttermilk, but I love the chocolate! They are definitely not low-calorie recipes, but I was pleased to see that each muffin contains six grams of protein. One muffin is just the right size to complement my Kindergartener’s fruit/veggie/yogurt combo. I froze both batches, and let the muffin thaw in her lunchbox. If we’re snacking on them at home, I microwave them for around 30 seconds. While this option isn’t realistic for every picky eater, our daughter has enjoyed buying hot lunch at school. We look at the menu together and have found one or two options per week that she’s willing to try this month. She may ultimately come home and report that she didn’t like it, but the fact that she’s willing to try new food is encouraging. Even if we just figure out a few options she likes, that will simplify our food prep this school year. Some friends shared that requiring their children to pack their lunches themselves is helpful in overcoming picky eating and food waste. These parents keep an eye on the process to make sure their kids select healthy, balanced options, but they allow their children to make most of the decisions. This independence motivates the kids to eat what they have prepared. Hopefully my fellow parents of picky eaters can find enough new ideas here and elsewhere to make it through the school year. Good luck and try to stay sane!